For our stop in the Miami area we parked at the Larry & Penny Thompson Memorial Park & Campground. This is a Miami-Dade County park that is located about 20 miles south of the city of Miami, actually closer to Homestead, FL. 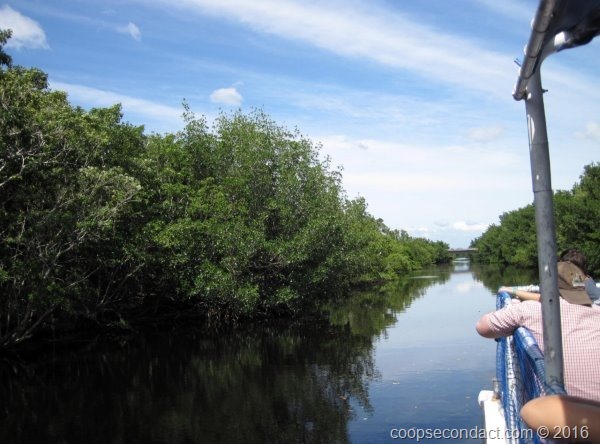 This location put us in between two national parks: Everglades National Park and Biscayne National Park. 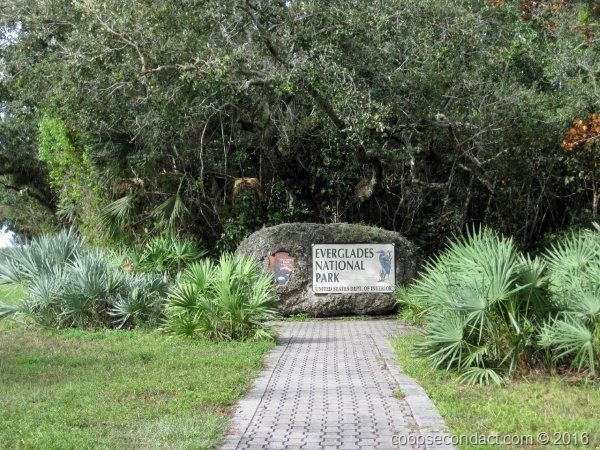 Everglades National Park is the first park area to be protected not for its scenic beauty but for its biological and ecological value. As the largest tropical wilderness in the United States this area supports 350 species of birds, 300 species of fresh and saltwater fish, 40 species of mammals and 50 species of reptiles. Although it is commonly thought of as a swamp, it is in fact the widest river in the world, however, it is shallow and slow moving, about 1/2 mile per day. Early settlers considered this part of Florida to be useless land and over the years tried in many ways to “reclaim” it so it could be put to better use. As part of our visit to the Everglades we went to the Flamingo Visitor Center which is located in the south central part of the park on the northern edge of Florida Bay. From there we took the Backcountry boat tour which travels north up a man made canal that connects to Coot Bay and then on the Whitewater Bay. Whitewater Bay is the second largest inland body of water in Florida. It is an estuary with brackish water resulting from a mix of fresh water that flows in the Everglades from Lake Okeechobee and salt water from the Gulf of Mexico. Among other wildlife, we saw both alligators and crocodiles. This is the only place in the world where these two species live in the same waters. The guide pointed out a very interesting plant, the Manchineel tree. This tree, which is native to Florida, is one of the most toxic plants in the world. Just brushing against the leaves can cause burns and blisters to the skin. The sap from the tree can literally burn through flesh and ingesting its fruit is almost certain death. We were told that it is possible to observe manatees coming up for air around the docks on the Florida Bay side of the Flamingo marina. Over a period of 15 or 20 minutes we were able to watch several of them surface and see two of them grazing on grass growing on the underside of one of the docks. We were reminded of our good fortune in being able to “swim with” manatees while snorkeling in Belize. The next day we went to Coopertown Airboats to take an airboat ride on the Everglades. This is one of those things that we wanted to do so that we could check it off the list. 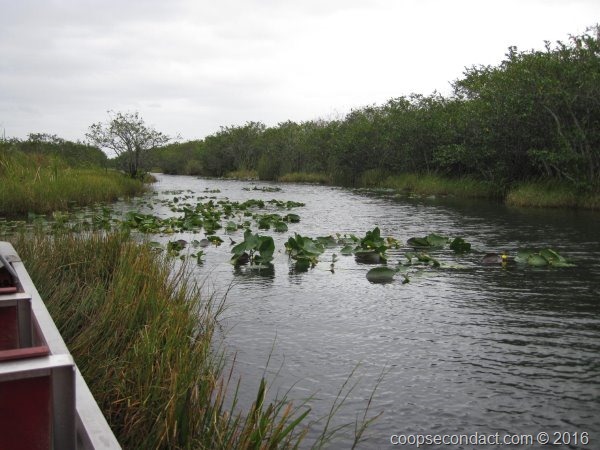 The Everglades experience was not very different from the prior day except that the airboat ride provided a little more thrill while careening across the “river of grass”. Almost all of Biscayne National Park is underwater. The portion not underwater is represented by the most northern of the Florida Keys, Key Largo being the first of the keys outside of the National Park. Under the water’s surface there are thousands of acres of coral reefs and over 200 species of marine life. The day we went to the park, south Florida was being affected by stormy weather, rain and wind. Therefore, none of the tour boats were able to get out on the water. We had to satisfy ourselves with whatever we could see from the visitor center.